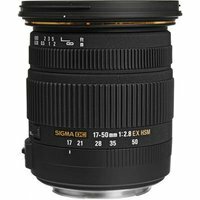 The Sigma 17-50mm f2.8 EX DC HSM lens is an image-stabilised, fast standard zoom for digital SLR cameras with an APS-C sized sensor. The lens covers a focal length from 17mm wide angle and offers a large aperture of f/2.8 throughout the entire zoom range, making it ideal for many types of photography such as portraiture and landscapes. The 17-50mm lens includes a hypersonic (HSM) autofocus motor to ensure quick and quiet focusing. It uses two elements made from Sigma's new FLD glass, plus two glass mould and one hybrid aspherical elements, to reduce aberrations and offer excellent image quality. Super Multi-Layer Coating reduces flare and ghost, meaning the Sigma 17-50mm lens has superior peripheral brightness and provides sharp, high contrast images even at the maximum aperture.